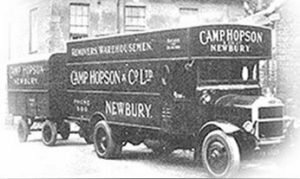 When Joseph Hopson founded his furniture store in 1861, he provided a furniture delivery service to the customer’s home. Thus was born the removals service which operates today. The important role that care has always taken in the removals business is, in part, reflected by the vehicles used. Camps have always been renowned for their removal fleet. Indeed, the livery on the 1937 vehicles would still be outstanding today. In fact, Camp Hopson Removals have a fleet of 8 containerised removal vehicles, from 2,200 cu ft down to 650 cu ft. The service operates out of two purpose-built, modern containerised warehouses (with a total of over 810 storage containers) in Hambridge Lane, Newbury and the Grove Trading Estate, Dorchester.